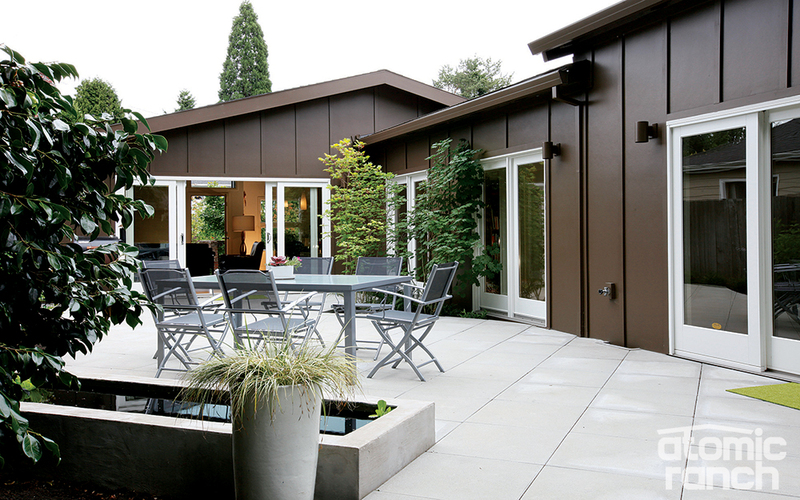 A prime example of this process is the home of Shannon Spence and Jeanne Tobey, two Realtors who renovated a 1954 ranch in the Reed neighborhood of Portland, Oregon. 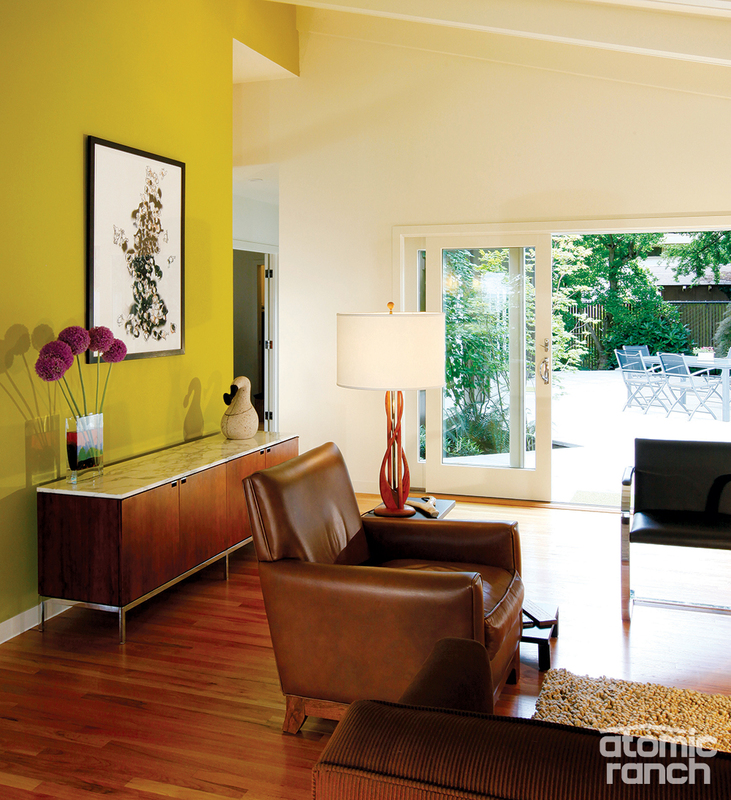 The couple purchased the home in 2007 and began an extensive down-to-the-studs renovation. Driving around Reed, a mix of both modern and traditional brick hip-roof ranches built by developer Way Lee, I spotted this home still under construction in 2008. 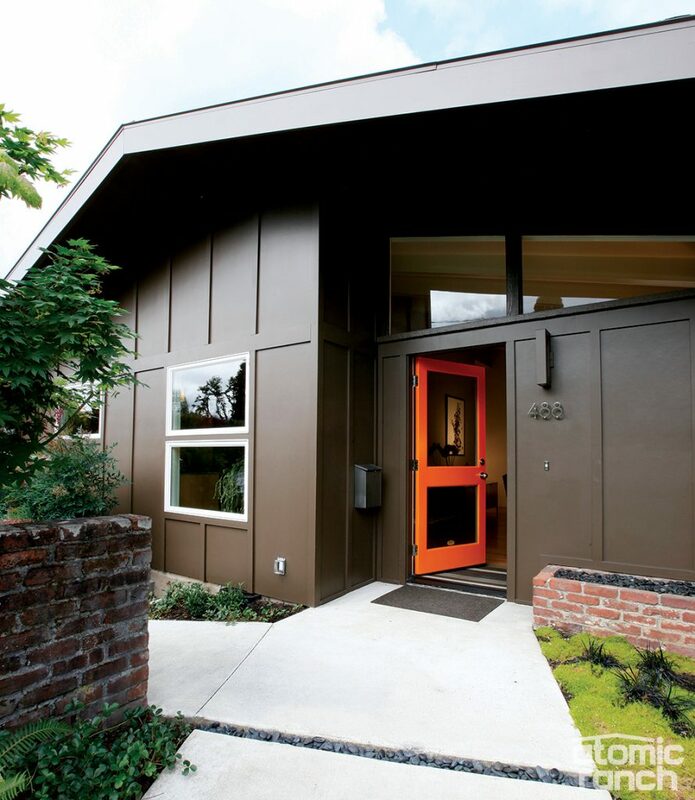 With its bright orange front door, it loudly promised a cool midcentury update. I rarely do this, but that day I boldly approached the contractor and slipped him my card. I thought maybe this house, if everything turned out right, might be an Atomic Ranch feature. Occasionally I’d drive by the home, watching the progress, until finally it was ready to be photographed in June 2009. From first contact to now, it’s a little shy of three years that this feature has taken to get to your mailbox. The original mahogany paneling remained up throughout the restoration process; it was cleaned and oiled to bring back its luster. 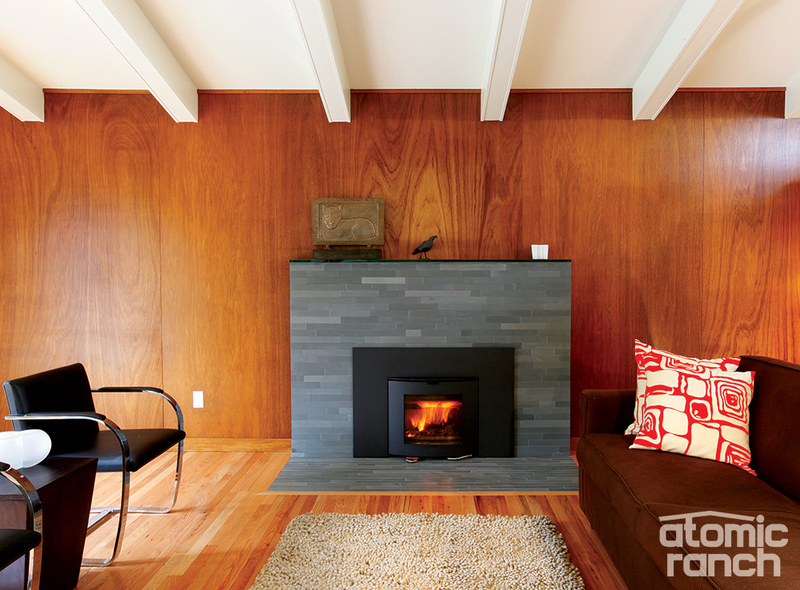 The fireplace insert is by Scan, and the surround and hearth are Ann Sacks tile. On the mantel, a bas relief cat is by Benny Bufano. Spence toured his first Rummer some 15 years ago and recognized how ranches successfully linked outside and inside, and that one wasn’t isolated from the site by a second story. But he also admits that California ranches with slab floors and vaulted ceilings don’t work as well with the colder winters of Oregon. It was the flat lot, single-level and volume of the main room, as well as how the inside and outside communicated with each other, that brought the couple to this modest L-shaped ranch. Coming from a 1950s duplex they loved, designed by modernist architect Kenneth Birkemeier, the couple felt this new house put them in a great neighborhood close to downtown—a big deal in bike-centric Portland. The painting by Christine Bourdette and a cement sculpture by Christine Clark sit on the marble-topped Knoll credenza. While Tobey and Spence are technically only the second owners, the home had been a rental for several years and suffered from severely deferred maintenance. Worn carpet, outdated heating, vintage electrical, kitchen cabinetry falling apart and original siding in need of intervention pretty much describe the condition. “I could have got $5 in beer bottle deposits when we cleaned out the house,” Spence jokes. 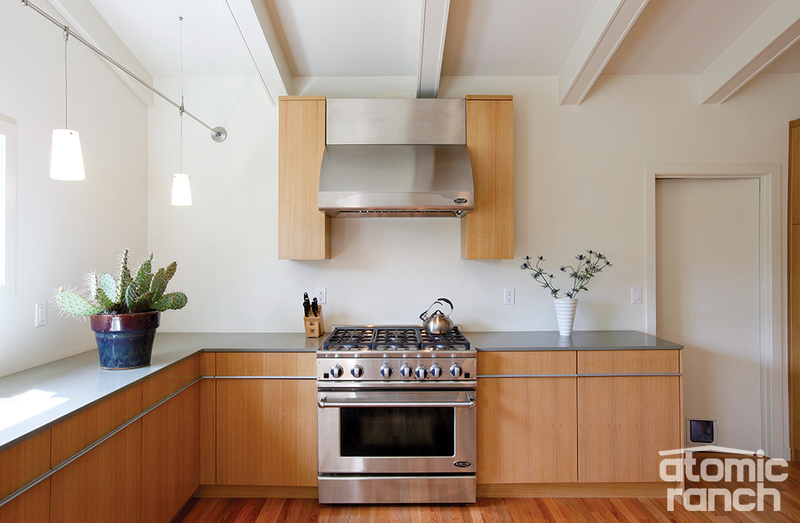 The stove and exhaust fan are DCS by Fisher & Paykel, and the suspension lights are “Pint” by Tech. The door leads to the garage and an exercise room, and all original rough-sawn interior beams were resurfaced with radiata pine. The 7-month project included new HVAC, electrical and plumbing systems, as well as insulation, new sheetrock and exterior siding. A 560-square-foot master suite addition at the rear brought the home’s square footage up to 1,710. Enlarged doors and windows, a custom kitchen with white oak cabinetry and all new hardscape in the backyard round out the list and give an idea of the work involved. 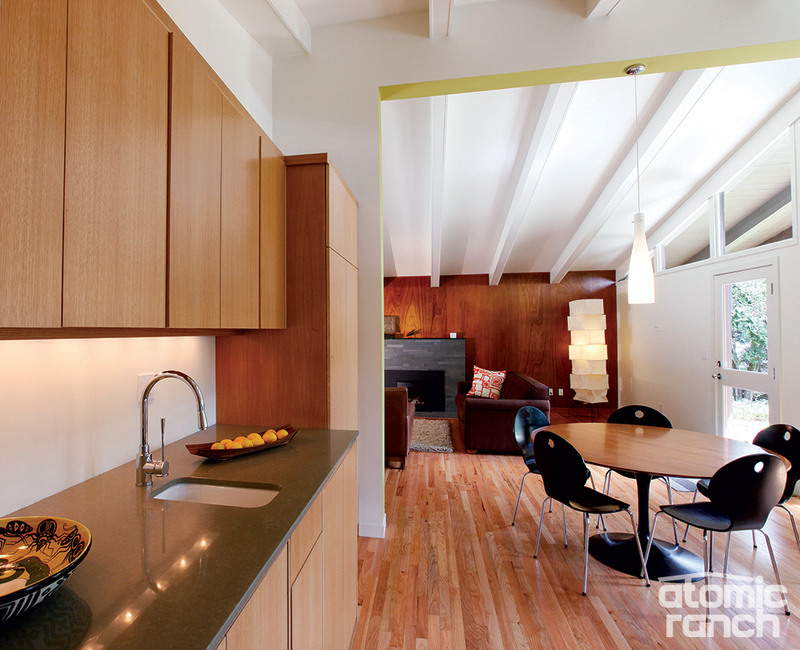 Neel Briggs of Big Branch Woodworking was responsible for the rift-sawn white oak cabinets that line the three walls of the kitchen and set the minimalist tone. The Jenn-Air refrigerator and Bosch dishwasher are clad as well, and the counters are “Rosemary” CaesarStone with a Blanco faucet at the bar sink. The Saarinen dining table is paired with contemporary chairs, and a Noguchi Akari floor lamp is visible against the north wall of the living room, which has a couch and armchair by Castellano Custom Furniture. “I can’t remember who can claim the idea for the master, but I know it came up very quickly the first time we walked through the house. The footprint was just too small,” Tobey says. At just a little over 1,100 square feet, the two-bedroom, one-bath house didn’t have a single window looking out to the underused backyard. 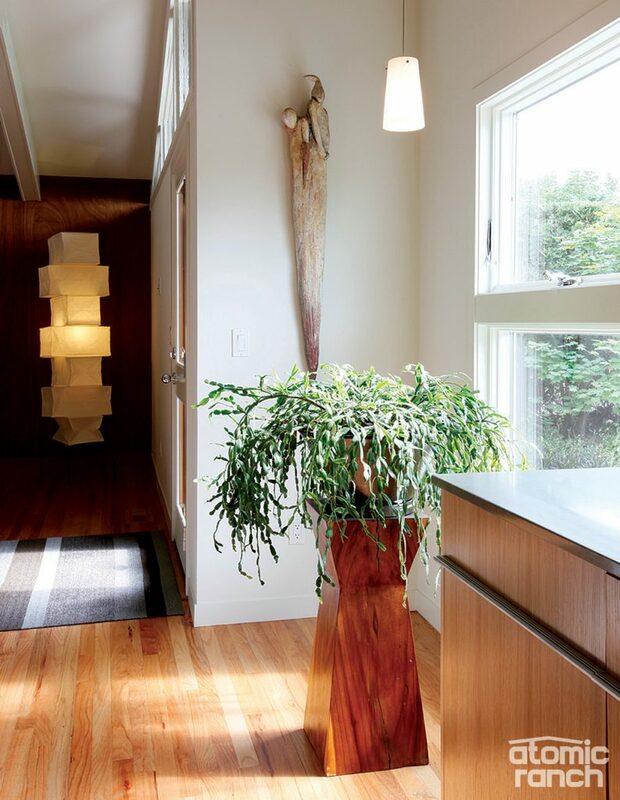 Ceramic art on the entryway wall is by Dana Louise, and the plant stand was purchased on a trip to Bali. Tobey adds, “The ADA modification was a huge component of our plan. We knew my father faced mobility issues, but now my parents always stay here when they visit.” To that end, the home is strictly one level, with opened up doorways, a wide hall, roll-in shower, minimal thresholds and zero step-down to the paved back yard. 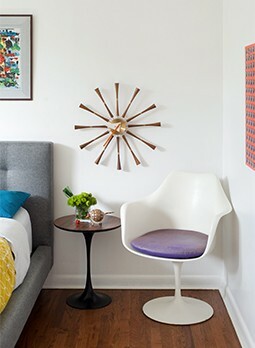 Beyond the universal design, the home speaks to their feelings about “stuff.” “With this new economic climate I read more articles about people living in a smart space rather than living in a giant space. The urge to simplify is gaining and people are looking at the way Europeans are living,” Tobey says. After the 1956 house was stripped down to the studs, HardiePanel vertical siding and battens of radiata pine formed the new exterior. A smooth concrete walk from the driveway addresses the homeowners’ interest in ADA-compliant design, while the path from the curb has decorative gaps filled with Mexican pebbles. The orange Simpson door is a promise of modern things to come. 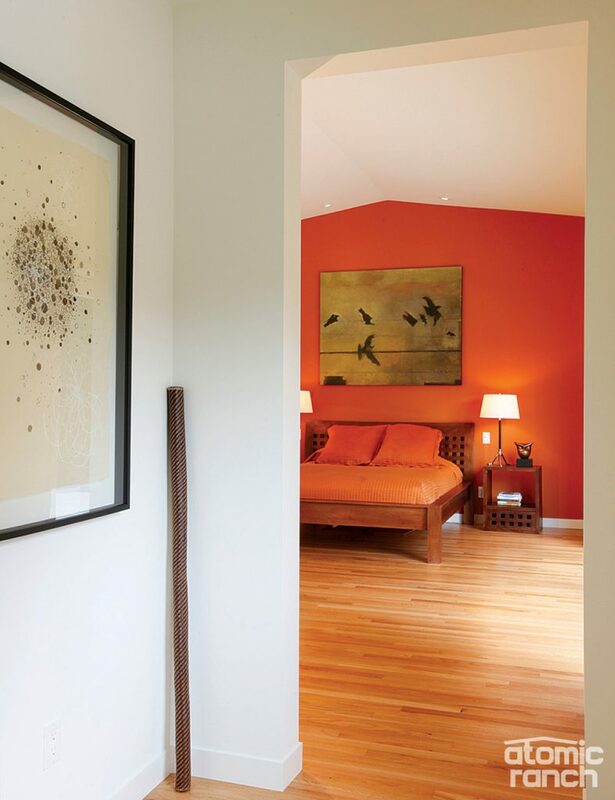 A wide hall and open doorway lead to the master bedroom, with its bed and nightstand from Bali. “Birds on a Wire” by Rachel Sanders hangs on the orange wall, and a rain stick from a trip to the Amazon leans in the corner. It should be no surprise that realtors like to look at houses. Spence and Tobey will book extra time on vacations to tour real estate listings and, midway through the renovation, they visited Arapahoe Acres, near Denver. The topography of that subdivision gave them an appreciation of siting and hardscaping that they applied to their own home. The original backyard had a seven-inch step down from the house and reflected typical ’50s landscaping: some mature plantings surrounded by toasted grass and broken concrete. Working with Barbara Hilty Landscape, they added an expansive patio, curved borders and a reflecting pond, while retaining a sizeable Japanese maple, camellias and rhododendrons. Out front, with the exception of the original brick half wall, native Northwest plants and new wide Steve Schoffman, design link concrete pads and paths define the front entry, as well as that knockout orange door. The patio view shows the slightly taller addition on the right, with the original house sections in the center and the gabled living/dining/kitchen volume. Anderson sliding glass doors bring the outdoors into the master suite and flood the hallway with natural light.